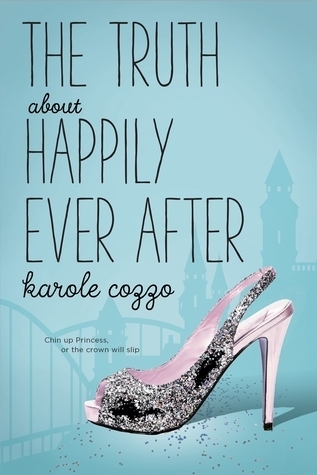 I was super excited to reading The Truth About Happily Ever After by Karole Cozzo, as I read her two previous books, How to Say I Love You Out Loud and How to Keep Rolling After the Fall, and really enjoyed them both. I was looking forward to seeing what Karole had come up with next! One of the things I enjoyed most about this book was the setting. It's in a THEME PARK!! I can't say that I've read too many books with this setting before, and I kind of loved it. And the main character probably has one of the coolest jobs ever, working as Cinderella in said park. Ok, I say this is a cool job, but it probably sounds cooler than it actually is. I can't imagine being around so many people all day long, AND working outside in the heat. No thank you! But, it was definitely interesting to read about. And, I have to wonder if Karole has done Alyssa's job before, or if she just did a really good job at researching it. The details were insane! I really enjoyed reading the story from Alyssa's point of view. As I mentioned above, some of the things she had to go through for her job sounded pretty grueling at times. But she had a great attitude, and definitely played the part of Cinderella perfectly, even when life threw her some lemons. She has some pretty awesome friends as well, though I did like her work friends a whole lot more than her school friends, and my favorite friend would have to be Miller. Miller! Everyone needs a friend like Miller. Overall; The Truth about Happily Ever After was definitely an interesting read, and I’m glad that I managed to work it into my TBR this month. I’m super curious to see what will be coming out next for Karole, as I’m sure I’m going to enjoy it as well! I love Cozzo. Summer, theme park -- sounds just right to me. Great review!